When I photograph weddings I sometimes ( most of the time ) bring along one of my obscure film cameras. I do it to entertain myself. It is fun for me and keeps me in touch with my personal film past. For those that don’t know, film was once used to shoot weddings. I was one of them. One of the cameras I may show up with is my 4×5 view camera. It produces a four inch by five inch negative ( hence the name ). It is very cumbersome but it does produce a wonderful image. This is the type of camera that the tilt-shift lenses emulate. There is software that tries to simulate the effects quickly and easily but I feel it falls short if you know what you are looking at. 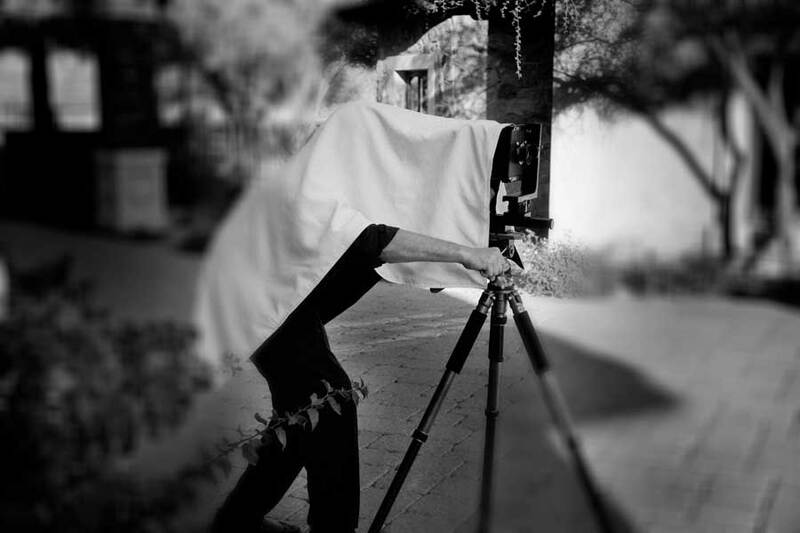 Anyway… here is a shot of me and my 4×5 at a recent wedding at Sassi in North Scottsdale. Thanks for looking. Fell free to post any questions or comments you may have. P.S. The software mentioned earlier was used in this shot. I am happy that it was only a trial version.